Our trip to the island was not picturesque or lovely, but rather very, very wet and sloppy. However, we did come away with three points, which was the main objective, so I guess we were not really concerned with appearances. And those three points put us top of the table, if only temporarily, depending on the result of Udinese and Juventus. And despite the wet conditions, we got a clean sheet, too. So I guess we can forgive our tired heroes their waterlogged performance. It was a cold and rainy night, the stuff tall tales are made of. And so appropriate that Cagliari would then score first. That’s right, after Cossu sent a cracking shot in that was saved by Abbiati (or the goalpost, depending on who you ask,) in the fourth minute, there was a beautiful pass from Ibra, to Robinho, who then masterfully crossed it in to Nocerino. But not to be denied his moment on the scoresheet, Pisano sent it home into the back of the net (even if he was really trying to clear it.) So an almost-Nocerino goal turned out to be a Pisano own goal. Cagliari had the Christmas spirit. 1-0 Milan. I'm not ready to bet money on him, but he did well enough. Bonera and Mexes made a couple of clearance mistakes in the 10th and 14th minutes respectively, but went on to redeem themselves later in the match. And in the 14th minute also, Ekdal took a shot from distance that forced a save out of Abbiati. We had heard rumors about the fitness levels of all of our keepers in the past days, but Abbiati never wavered, and played 100% on the night, rain and all. Speaking of sloppy defending, Aquilani still proves to be a bit of a liability on defending, with late or sloppy tackles that cause us to give up free kicks, sometimes in dangerous areas. Like in the 16th minute, when his foul gave Cagliari a free kick just outside of the area. But, as I alluded before, Bonera dealt with it easily to redeem himself. Ambrosini had apparently asked Santa for a yellow card this Christmas, which the ref awarded him in the 21st. Then Aquilani with a late challenge on Cossu that easily should have been a yellow, but he would not get that Christmas wish tonight. Taiwo, who has previously not impressed me on defense, showed off some mad defensive skills vs. Ibarbo in about the 24th minute. Despite some weak spots, I thought he really stepped up his defensive game tonight, even if his offensive game then went lacking. In a cruel bit of irony, or as conspiracy theorists would call it “match fixing,” in the 32nd Cossu did earn his yellow card for a foul on… who else? Aquilani. But Aquilani returned the good faith with some excellent bits of defending in the 35th and 38th minutes. Which concludes my woeful tale of our first half - scrappy play, rudimentary possession, makeshift defending, and a gift from the opposition to put us ahead. He will do anything to get the ball forward, but scoring is not so easy. The second half would prove to be quite similar, even if the offensive efforts were a little prettier and one goal more effective. Aquilani had a shot that was cleared by Cossu in the 50th, then Ibra had a shot a minute later that was deflected by Agazzi. Cagliari then had a flurry of shots cleared by Mexes or saved by Abbiati, they would finish with a total of 13 shots, 6 on goal. And it wouldn’t be a Milan match with Robinho on the pitch without at least one sitter, which he executed well in the 58th. I swear, I think that poor guy has A-score-aphobia, or the fear of open goals. He works so hard, he makes key passes and runs, plenty of assists, and he even scores enough in the end. But his sitters have become a trademark, an undeserved label for such a great player. In the 60th, Ibra showed him the way. After receiving a great header from Robinho (his second assist on the night), Ibra reached and stretched to beat his defender to send it in the back of the net. 2-0 Milan. It marked his 11th goal in 13 league matches, with a couple of assists in there, too. Wow. Somehow, he was injured, though, apparently off camera, as in the 62nd, he was crouched down in discomfort with what looked like a bloody knee. Hopefully it was nothing serious, as we need our Herculean forward in good health. If that man is not a god, he is at least a demigod. There were two more yellow cards, one for our Bonera in the 64th for a late foul on Agostini, and then one for Larrivey in the 69th. Ballardini made substitutions in the 62nd and then a double sub in the 79th, but they were unable to make enough difference. 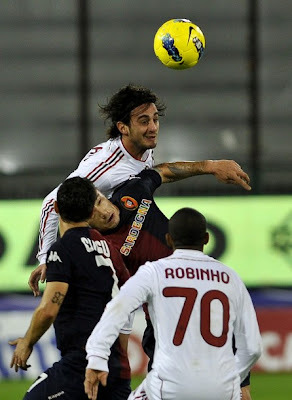 Pato came on for Robinho in the 73rd, and had a couple of great runs straight at the goal that had to be saved by Agazzi in the 80th and 84th. 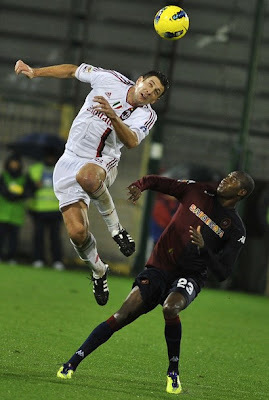 And Allegri sent van Bommel on for a weary Ambrosini in the 85th, leaving Thiago Silva once more wearing the armband. With only 54% possession, we managed only 6 shots in all, 3 on goal. We were even waterlogged in the statistics column. But, much like many of our victories on the road to becoming Champions last year, we managed to pull off the win in spite of ourselves. Well done. And I can’t be critical for our weary troops, who will get a bit of much deserved rest before training and playing a couple of exhibition matches in Dubai over the holidays. Damn that Pisano! 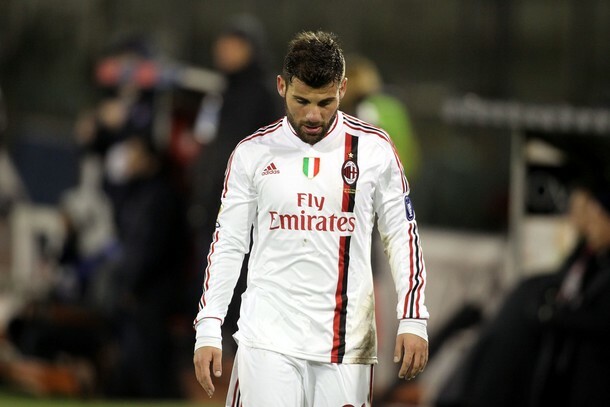 That would have been Nocerino's 7th goal of the season! So for tonight, we are winter Champions, even if Juve take back the crown tomorrow. Considering how we started the season and how many points we dropped, I could not be more proud of our boys. It wasn’t pretty, in fact it’s a game to forget. But it’s three valuable points that may be very crucial in the long run. And the confidence boost of being unbeaten in the league since early October, not to mention another clean sheet. So even if we were a bit waterlogged, our boys go into the holiday break as heroes in my book.